WEARING: American Apparel Jacket and Dress, Alexander Wang Marion Bag THP Shop Bound Cuffs and Galisfly Ring Set. Obsessing over my new hardware. Accessories for me have always been clean and minimal. 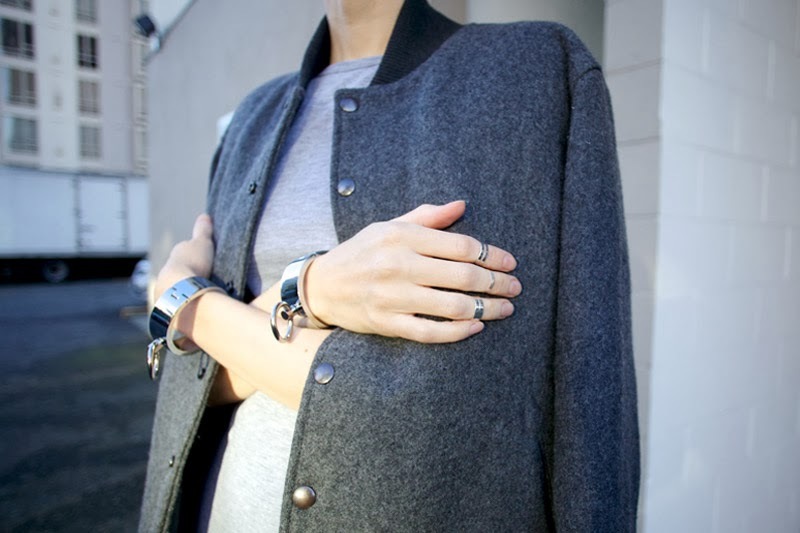 The Galisfly rings and THP Bound Cuffs have been in high usage. Expect to see these babies a lot because they fit my style perfectly. If you liked the rings, there is another set that I love, check them out here. Perfection! You make me want to add more jewelry to my wardrobe. totally understand this cuff obsession! those cuffs! been lusting after those for quite some time. they def suit your style. they fit seamlessly into your wardrobe! i need those.. so proud of haute pursuit!! love all the textures going on here - especially with the jacket and the bag - beautiful! the galisfly rings are gorgeous too!